Deficiency of spleen qi with accumulation of damp. Symptoms include poor appetite, dyspepsia, epigastric pain or distension, acid regurgitation, hiccoughs, nausea, loose or watery stools, borborygmus (intestinal gurgling). Fatigue with heaviness of the limbs. 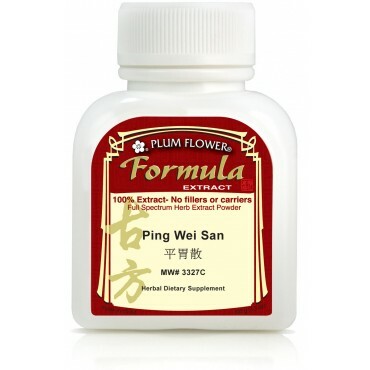 Useful in gastric ulcer and chronic gastritis are some of the imbalances satisfied clients have used this product for. Atractylodes lancea rhizome, Magnolia officinalis bark, Citrus reticulata peel, Glycyrrhiza uralensis root, Zingiber officinale rhizome-fresh, Zizyphus jujuba fruit. - Cang zhu, Hou po, Chen pi, Gan cao, Sheng jiang, Da zao.